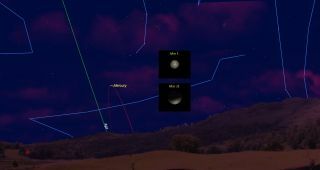 Peak visibility for Mercury in the evening sky occurs at month's end, with the planet approaching greatest eastern elongation from the sun. Venus will leave the evening sky this week as it passes through inferior conjunction on March 25 and transitions into a morning object. But as Venus departs the evening sky, another planet will soon take its place: Mercury, the planet closest to the sun. Beginning now and running into the first week of April, Mercury — a somewhat overgrown version of our moon — will have an evening appearance about as favorable as Northern Hemisphere denizens ever get to see. Mercury is popularly known as the "elusive" planet, but despite its reputation, the planet is actually not very difficult to spot; just find a reasonably unobstructed horizon. A clear, haze-free sky also helps. There is an oft-told story that Nicolaus Copernicus, the man who pushed hard for placing the sun — and not the Earth — at the center of our solar system, never saw Mercury. Although the climate of his homeland (Poland) tended to be rather cloudy and misty, one would have to believe that such a noteworthy figure in the field of astronomical calculation must have surely tried to spot Mercury when the weather was more favorable. Indeed, Mercury was far from impossible to glimpse during elongations as favorable as the upcoming one. Currently, Mercury sets about 45 minutes after sunset. About a half-hour after sundown, look for it very near to the horizon, a bit to the north of due west. Weather permitting, you should have no trouble seeing it as a very bright "star" shining with just a trace of a yellowish-orange tinge. Mercury is currently shining at a very bright magnitude of minus 1.4 on the brightness scale used by astronomers. In fact, among the stars and planets, Mercury now ranks behind Venus and Jupiter, and is tied for third with Sirius (the brightest star). On Saturday, March 25, Mercury will be 2 degrees to the right of Uranus. The best observing times will be between 8:15 p.m. and 8:45 p.m. local time, when Mercury should be readily visible with unaided eyes. Uranus will require binoculars or a telescope to see. In the evenings over the next few weeks, Mercury will diminish in brightness — slowly, at first — but it will also be arriving at its greatest elongation, 19 degrees to the east of the sun, on April 1. (Your closed fist held out at arm's length covers 10 degrees of the night sky.) Shining then at a magnitude of minus 0.2 (just a trifle brighter than the similarly hued star Arcturus), Mercury should be readily visible, appearing low in the western sky and setting more than 90 minutes after the sun. Mercury, like Venus and Earth's moon, appears to go through phases. Right now, it resembles a gibbous phase, which is why it currently appears as bright as Sirius. By the time it arrives at its greatest elongation, it will appear roughly half-illuminated, and the amount of its surface illuminated by the sun will continue to decrease in the days thereafter. So when it begins to turn back toward the sun's vicinity after April 1, it will fade at a rather rapid pace. In fact, on the evening of April 8, Mercury's brightness will have dropped to magnitude 1.6 — as bright as the star Castor, in Gemini, and only one-sixth as bright as the planet appears now. In telescopes, it will appear as a narrowing crescent phase. In all likelihood, this will be your last view of it, for the combination of its rapid fading and its descent into the brighter sunset glow will finally render Mercury invisible by the second week of April. In ancient Roman legends, Mercury was the swift-footed messenger of the gods. The planet is well-named because it's the closest planet to the sun and the swiftest of the sun's family of eight planets, averaging about 30 miles per second (48 kilometers per second) and completing one circuit of the sun in only 88 Earth days. In the pre-Christian era, Mercury actually had two names, as people at the time did not realize that the planet could alternately appear on one side of the sun and then on the other. The planet was called Mercury when it was in the evening sky, but it was known as Apollo when it appeared in the morning. It is said that Pythagoras, in about the fifth century B.C., pointed out that they were the same. One final note: About 45 minutes after sunset on March 29 , look low toward the west, and you'll see a slender waxing-crescent moon sinking toward the horizon. And situated well off to its right, you'll see Mercury — a great occasion to make a positive identification of the so-called elusive planet using our nearest neighbor in space as a benchmark.